Is the Movie Unbroken Broken? A few months ago I was sitting in the theater waiting for the featured film to start. As with any movie these days, there is an onslaught of trailers before the feature actually starts to roll on the screen. 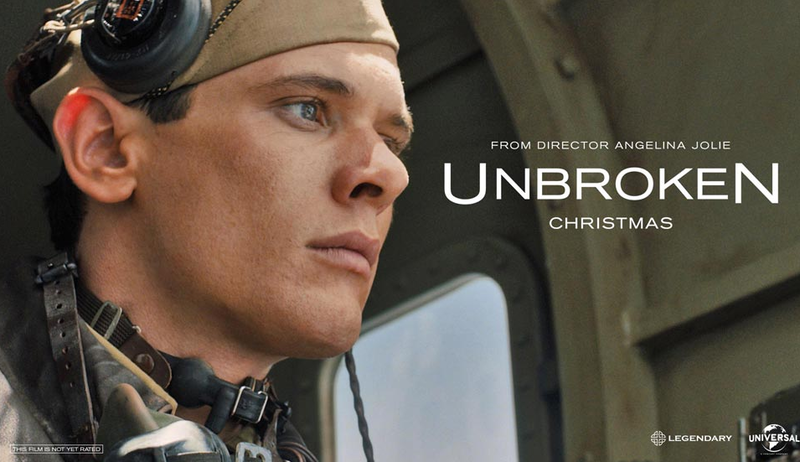 One of the trailers that caught my attention was for a new film called “Unbroken” ( in theaters Christmas Day). The trailer caught my attention, most of all because of the book that chronicles the journey of WWII American Hero Louis Zamperini and how faith in Christ transformed his life. I will say that after seeing the trailer, “Unbroken” looks like an entertaining and inspirational movie, but is this film worthy of my $12 dollars at the box office? In order to answer the question, I did a little research and discovered there seems to be some concern about the content in the movie and the absence of key elements to the story of Louis “Louie” Zamperini. According to an article in the Christian Post, Pastor Greg Laurie states that he is disappointed that Director Angelina Jolie chose to leave out the WWII hero’s Christian faith in the upcoming movie. If you have read the book or viewed any of Zamperini’s interviews, his faith is an important part of the story. Pastor Greg Laurie interviewed Louis Zamperini at the November 10, 2011 Harvest Crusade at Dodger Stadium. In the interview you hear about his amazing life story how he reflects on the importance of faith in Christ in his life. I also discovered a few comments from Christian Media critic Ted Baehr. Here is what Ted stated regarding the film. It sure seems that his conversion is just as important as his physical release from imprisonment. It’s like saying, which wing of the airplane is more important, the right or the left wing? It’s obvious that both wings are of vital importance. So it seems with this story, the faith elements are vital to the overall story. So, is the film broken because of the deletion of Zamperini’s faith in Christ and his conversion at a Billy Graham Crusade in San Fransisco? I also have to ask the question, why did the director leave out this part of the story? Is Hollywood pulling a “Noah” with “Unbroken” and leaving us to believe that they are staying true to the original storyline? According to the “Unbroken” movie web site, Unbroken is the most inspirational and faith-revitalizing film you’ll see all year. Is this just Hollywood’s spin to convince the faith audience that they should show up and support this movie regardless of the missing elements that is said to be deleted in the film? Although Zampareini’s conversion story seems to be left out, there are some references to faith highlighted in the movie trailer, such as a pastor preaching to a young Zamperini: “However dark the light, however dim our hopes, the light will always follow darkness,” the pastor says. But is this enough to cover the bigger faith elements that are said to be missing from the film? In the end, is Unbroken, broken? If you are going to see the movie as purely entertainment, then I would say that it is not. If you are going to see the movie that is based upon the book and Zamperini’s complete life story, than I think the movie is broken. You will have to decide if seeing the film is worth your time and money. At the end of the day, I really want to support this film and I am disappointed that the faith elements seem to have been deleted from the story. Do I feel the movie is worthy of my $12 dollars? Well, yes I do. Having read the book, I will use it to fill in the complete back story as I watch the movie. Also, understanding that the film is not a conversional story, it will indeed be conversational with multiple lessons to learn about the survival and resilience of a true American hero. Academy Award® winner Angelina Jolie directs and produces UNBROKEN, an epic drama that follows the incredible life of olympian and war hero Louis “Louie” Zamperini (Jack O’Connell) who, along with two other crewmen, survived in a raft for 47 days after a near-fatal plane crash in WWII – only to be caught by the Japanese navy and sent to a prisoner-of-war camp.Adapted from Laura Hillenbrand’s (“Seabiscuit: An American Legend”) enormously popular book UNBROKEN brings to the big screen Zamperini’s unbelievable and inspiring true story about the resilient power of the human spirit.Starring alongside O’Connell are Domhnall Gleeson and Finn Wittrock as Phil and Mac – the airmen with whom Zamperini endured perilous weeks adrift in the open Pacific – Garrett Hedlund and John Magaro as fellow POWs who find an unexpected camaraderie during their internment, Alex Russell as Zamperini’s brother, Pete, and in his English-language feature debut, Japanese actor Miyavi as the brutal camp. The date has been set and both opponents have their eyes on Valentines Day weekend for the big showdown. It is going to be an interesting lead up to the release of the both of these films. Just like the announcement on media day for an upcoming heavy weight boxing match, the challenges begin. I noticed the following question that was posted this morning by the studio for Old Fashioned and I think it is very interesting question and is drawing a very distinct and clear line in the sand. You can call me old fashioned, but I am going with the one on the right! I have viewed the 50 Shades trailer in a recent set of previews and this movie is just wrong on so many levels and I believe 50 Shades will have a profound negative effect on the culture. I believe a movie like 50 Shades are contributing to the free fall down the slippery slope as a society. The movie Old Fashioned will definitely stir the pot and cause much conversation, debate and reflection about what love is and what love is not. The Good Lie – In Theaters Now! The Good Lie opened this past weekend in a limited release and the studio plans to go wider in the weeks ahead. I have not yet viewed the movie, but I am looking forward to taking in this film. From what I hear, this is a incredible heartwarming story of the human spirit that will cause you to stop, think and evaluate your life. Let us know what you think about the movie. Orphaned by the brutal Civil war in Sudan that began in 1983, these young victims traveled as many as a thousand miles on foot in search of safety. Fifteen years later, a humanitarian effort would bring 3600 lost boys and girls to America. In “The Good Lie,” Philippe Falardeau, (writer and director of the Oscar®- nominated Foreign Language film “Monsieur Lazhar”) brings the story of their survival and triumph to life. Academy Award® winner Reese Witherspoon (“Walk the Line”) stars alongside Sudanese actors Arnold Oceng, Ger Duany, Emmanuel Jal, and newcomer Nyakuoth Weil, many of whom were also children of war. Mamere and Theo are sons of the Chief in their village in Southern Sudan. When an attack by the Northern militia destroys their home and kills their parents, eldest son Theo is forced to assume the role of Chief and lead a group of young survivors, including his sister Abital, away from harm. But the hostile, treacherous terrain has other dangers in store for them. As the tattered group makes the difficult trek to Kakuma refugee camp in Kenya, they meet other fleeing children, forging a bond with Jeremiah, who, at 13, is already a man of faith, and Paul, whose skills become essential to their survival. Thirteen years later, the now young adults are given the opportunity to leave the camp and resettle in America. Upon arriving in Kansas, they are met by Carrie Davis (Witherspoon), an employment agency counselor who has been enlisted to help find them jobs—no easy task, when things like straws, light switches and telephones are brand new to them. Although Carrie has successfully kept herself from any emotional entanglements, these refugees, who desperately require help navigating the 20th century and rebuilding their shattered lives, need just that. So Carrie embarks on her own unchartered territory, enlisting the help of her boss, Jack (Corey Stoll). Together, against the backdrop of their shared losses, the Lost Boys and these unlikely strangers find humor in the clash of cultures, and heartbreak as well as hope in the challenges of life in America. Brad Silverman and Russ Rice of Coram Deo Studios are launching a new film and they are enlisting support from the Christian community. They are attempting to make the boldest Gospel-centered family film ever. Take a look at the video below to hear more about this new endeavor from Brad and Russ. Here is a synopsis of the new movie from Coram Deo Studios. “This touching & poignant family film traces the story of husband, father & author Scott Dempsey who calls himself a Christian, but his life simply doesn’t reflect it. He can talk the talk – but doesn’t walk the walk. That is until Al Watson (a seventy-five-year-old African American who happens to be the Jackie Robinson of NASCAR) befriends Scott’s young family and lives out a loving, Christ-like example before them. Over time, Al presents Scott with the true, Biblical, regenerating gospel of Jesus Christ… then the real journey begins.” The film will go into production early next year and plan for Summer2015 release. If you would like to know more about this project and to support the movie with your dollars, click on the link below. click here to find out more information. Produce is Coming To Theaters! This year has been the year filled with movies based upon the Bible. The new year seems to be no different and may even deliver many more faith films than 2014. There is a new film called “Produce” that is slated for theaters in the Spring of 2015. This is a film that not only entertains, but leaves you inspired. You will appreciate the simple things in life and gain a greater understanding of how to view the world with a little different perspective. Check out the trailer and keep your eyes open for “Produce” the movie. TriStar Pictures, Affirm and Provident Films presents a new film called Heaven Is For Real. It’s based on the #1 New York Times best-selling book of the same name, written by Todd Burpo with Lynn Vincent. It tells the true story of a small-town Pastor who must find the courage and conviction to share his son’s extraordinary, life-changing experience. Heaven Is For Real is directed by Randall Wallace (Bravehart, Pearl Harbor, We Were Soldiers, Secretariat). The screenplay is by Christopher Parker and Randall Wallace. It stars Greg Kinnear (“As Good As It Gets,” “Little Miss Sunshine”) as Todd Burpo and co-stars Kelly Reilly (“Sherlock Holmes: A Game of Shadows,” “Flight”) as Sonja Burpo, the real-life couple whose son Colton (newcomer Connor Corum) experiences Heaven during emergency surgery. Colton recounts the details of his amazing journey with childlike innocence. He describes Heaven in vivid detail, and speaks matter-of-factly about things that happened before his birth … things he couldn’t possibly know. Todd is called upon by his congregation to explain the meaning of Colton’s revelations, and he and his family are challenged to examine their faith and draw meaning from this remarkable event. From what I can see so far and after reading the book and previewing the film, I believe this movie could start and in some cases reignite a conversation about the subject of “Heaven” and what happens when we die. The fact is, we all will face death one day and hopefully this movie cause’s us all to explore the question “if there really is a heaven.” You know we have all asked the question “Is Heaven for Real?” Maybe not out load – but we all wonder about life after death. I for one find myself thinking and also preparing for heaven much more than I have done so in the recent past. We are all on a journey thru life and my prayer is that this movie will encourage people to help others to reach heaven thru faith in Christ. 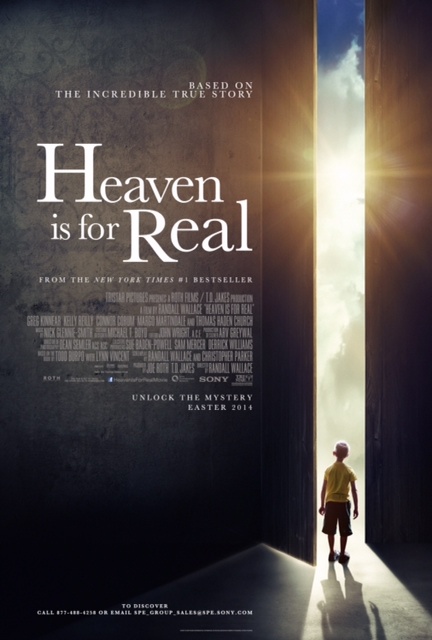 I highly encourage families to see Heaven is For Real on opening weekend. The first showings start Wednesday April 16, 2014. Check out the heart of the movie from Todd Burpo. Summer has come to an end and Fall is in the air. This means new school clothes, a new teacher, new friends and many other elements that are indicators that change is in the air. With the new season also comes a fresh batch of movies to theaters for families. Grace Unplugged is one of the releases that is Just around the corner and will hit the big screen on Friday October 4th. Family Films had the privilege to preview the film a few times this summer and we wanted to share our thoughts and encourage families to check out Grace Unplugged on opening weekend. Just 18, Grace Trey aspires to more than singing at her church. So she runs off to Los Angeles and begins to taste the stardom she’s always dreamed of, including a Top-10 song. Will everything she experiences lead her to reject her faith … or rediscover it? This summer Family Films had the chance to interview Brad Silverman who is the director and writer of Grace Unplugged. We were able to ask Brad a few questions about Grace Unplugged, how a movie can impact culture and how he landed in the film business. We continue our interview with the Director and writer Brad Silverman regarding the inspiration for Grace Unplugged. Grace Unplugged is an inspiring story that will cause you to laugh, cry, rejoice and sing. The cast is superb and features Kevin Pollack, James Denton, Shanwee Smith, Jamie Grace, AJ Michalka and an appearance from Chris Tomlin. The soundtrack is off the hook and you will find yourself singing along and tapping your foot (featuring Colton Dixon, Jamie Grace, Toby Mac, Shawn MacDonald, Luminate, Nine Lashes, AJ Michalka, Josh Wilson and Chris Tomlin). You can download the CD on Itunes now. It’s refreshing to have a film that is safe for the whole family and delivers an entertaining story that will leave you still thinking about the movie days after you exit the theater. So mark your calendars to see Grace Unplugged on opening weekend of October 4th. We’ll see you at the movies! When The Game Stands Tall is in production in New Orleans and is slated to hit theaters in the Fall of 2014 (Sony Affirm Films). I have to say that I am excited to see this movie because of the lead actor (Jim Caviezel) who plays the coach in the movie. Jim is a good actor and I really have enjoyed his film work over the years. I always remember the movie “Frequency” and loved the story and the father son relationship in Frequency. Anyway – back to “When The Game Stands Tall.” As I read the description for the film I am enthusiastic about the film because it is a sports film that in the end is not about sports. Sports is the vehicle that was used by the coach to teach the lessons of life to the high school kids in his care. It’s not about winning – but rather putting forth your best effort. Teaching about values, life and loss. The real stuff that happens in life and the game of footballs help high schooler’s prepare to navigate thru their journey. So based upon what I see so far . . . I am marking my calendar to see “When The Game Stands Tall” August 22, 2014! When The Game Stands Tall – which tells the true story of legendary De La Salle High School football Coach Bob Ladouceur, (Caviezel), and his assistant coach Terry Eidson, (Chiklis), who took the Concord California Spartans prep team from obscurity to a 151-game winning streak from 1992 to 2003 that shattered all records for consecutive victories in any American sport. Known as “Coach Lad”, Ladouceur had little experience coaching football when he was hired at De La Salle, but through his unyielding focus on character-building, faith, responsibility and commitment, created one of the country’s greatest football dynasties. Inducted into the National High School Hall of Fame and widely considered the greatest prep football coach of all time, Ladouceur’s spectacular achievements during his 34 years with the De La Salle Spartans include a historic 12-year, 151-game run of consecutive wins, 20 undefeated seasons, seven national titles, five CIF Bowl championships, 17 state championships and 28 CIF North Coast titles. When Ladouceur retired in January 2013, he was the all-time winningest coach in California having amassed one of the highest-winning percentage of any coach (.934 percent) with his 399-25-3 record. Big Idea is set to delivery a new episode from the award winning kids series VeggieTales. This time Larry The Cucumber takes the lead as “MacLarry” and brings us a lesson in getting along with others. Always a great reminder for kids and adults for that matter and as always audiences are served a brand new Silly Song (caution, may cause extreme laughter and singing unexpectedly in the car). The bad news is that you will have to wait until July 27th to secure your own copy. The good new is that we have the trailer for you to view. Oh, and by the way you can pre order your copy from http:///www.kidzonearth.com. A long time ago, in a land flowing with beards and kilts, there lived two clans who were locked in a longstanding feud! The tribes plotted against each other with various pranks, including water balloon ambushes, bad haircuts, and a host of other hijinks! Dwelling amongst these perpetual pranksters is “MacLarry” — a well-meaning young inventor who just wants to make kooky gadgets! Try as he may, he has never mastered the art of pranking, even after much training from the Chief prankster himself; his father, Chog Norrius. Discouraged, MacLarry sets on a journey to find the great inventor “Archie-medes”, in hopes of finding a place he can belong. Meanwhile, the feud is escalating and Chog’s clan is plotting their biggest prank yet; releasing the stinkiest cheese in the land on their rivals! When the cheese caper goes afoul, Chog and the people realize they aren’t able to solve the situation on their own — they need MacLarry’s special skills to save the day! 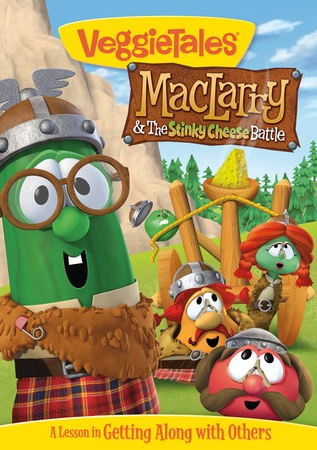 Will Chog and the tribe find MacLarry in time to convince him that his unique and God-given gifts are just what is needed to help both clans from being overcome by the loathsome Limburger and resolve their differences for good?